If you want to venture into the world of flexible, durable, tactile printed parts, then you came to the right place. Here is where you’ll learn to print flexible filament fast and easily print the softest filament on the market. This article focuses on how to print flexible filament with the Flexion Extruder. If you do not already use the Flexion Extruder, then go get one and come back here. Right out of the box, Flexion produces fast (60mm/s), clean, void-free prints with TPU, TPE, Ninjaflex, and other flexible filaments. Angus (aka Makersmuse) even uses it to test flexible filament: Review of Flexible Filaments (with X60!). Flexion eliminates the typical problems you encounter when you print flexible filament: jamming, buckling, and oozing. Read on to find a few tips to optimize your settings and produce perfect prints with your flexible filament. Retract high and fast – this keeps the nozzle from oozing and makes clean prints. Longer drive paths (Bowden drive, E3D hotend, Mk11 extruder), may require even longer retractions. We recommend that you increase outline overlap above 75% to ensure a good connection between outlines and infill. Other settings will be similar to what you use for other materials. First, adjust tension. Hold the filament between your fingers and load filament., then turn the adjust screw to maximize the pull-force on the filament. Most printers have a function to load filament automatically. If yours does not, then try this load/unload “print”. The photo below depicts two identical prints (one still has support material attached). The print on the left was made with a perfectly-functioning Flexion extruder. The one on the right had a small hardware issue that caused pressure buildup and “blobbing”. So how to fix this issue? Blobs/strings/pressure buildup – if the barrel (see the exploded view for part name reference) is not pushed all the way up into the mounting block, then the PTFE will be able to float between the nip point and the nozzle, allowing the accumulation of material between the PTFE and the nozzle. This is a problem that can manifest over time. You may get some number of “good” prints before seeing this effect. The best way to fix it is to disassemble your hotend, remove any material, and reassemble. Ensure that the barrel is seated on its shoulder against the bottom of the mounting block. Make sure to tighten the nozzle when it is at temperature to get a good seal. Bumpy surfaces/inconsistent extrusion – this can be caused by bad settings. Before you consider hardware issues, adjust temperature and extrusion up and down. If that doesn’t help, you may have an under-powered extruder motor. This can “cog” toward a stable magnetic position when it should be micro-stepping, causing visible areas of over- and under-extrusion. To operate the Flexion, we recommend a minimum of 250N-mm of torque. Most Nema17 motors achieve this, but some drivers do not deliver enough current. This happens most often on Wanhao (and similar) printers, specifically one batch that shipped in early 2017. To adjust current, follow the guide here. You can also find replacement motors on Amazon. 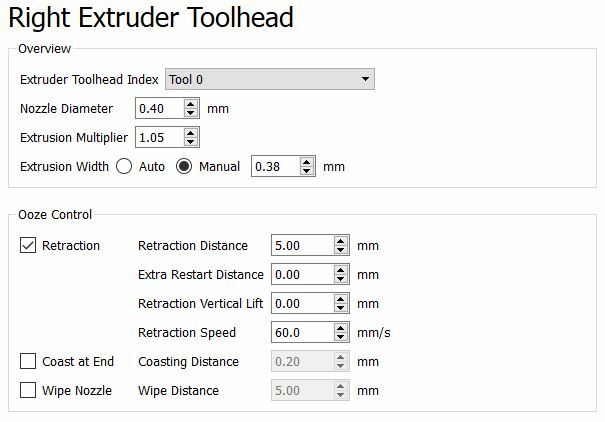 We hope this helps you print flexible filament with the Flexion Extruder. If you have any questions, we are always here to answer them! Just send a message through our contact form.